(Katydid Grasshoppers (Tettigoniidae) - 05) Katydid is a general name given to several species of American large green long-horned grasshoppers. 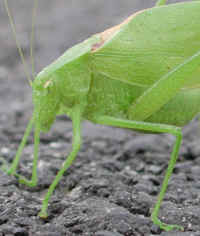 Technically, katydids are not grasshoppers, but are more related to crickets. 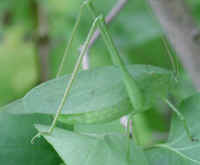 The male katydids have stridulating organs on the forewings that produce a loud shrill sound. (Katydid Grasshoppers (Tettigoniidae) - 06) Notice how well the katydid blends into the coloration of the plant life. This one didn't seem to be afraid of us, only camera shy. (Katydid Grasshoppers (Tettigoniidae) - 01) We found this katydid on the road and gently placed him or her on the grass. 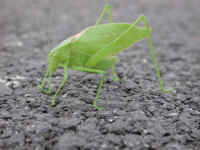 From the injury on the katydid's back, we believe he or she was hit by a car. (Katydid Grasshoppers (Tettigoniidae) - 02) This katydid has extremely long antennae. They seem to be longer than the rest of the body. 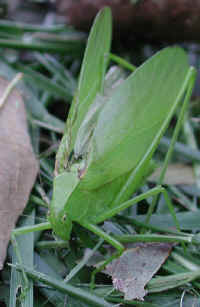 Once we set the katydid down on the grass, he or she began to walk about. Perhaps the injury was not as serious as it looks. (Katydid Grasshoppers (Tettigoniidae) - 03) This photo gives us a better view of the katydid's head and extremely long antennae. (Katydid Grasshoppers (Tettigoniidae) - 04) The katydid's wings look like leaves, and the long thin rear jumping and pushing legs look like coarse grass or thin bent green branches of a plant. (Katydid Grasshoppers (Tettigoniidae) - 07) Evelyn Giefer sent us this katydid photo with the following comment: "Here is a picture of another wonderful creature photographed in my backyard. As I watched, he/she moved his back legs up to his mouth and groomed them one at a time. I was so close I could see his eyes and mouth parts moving! It was a moment of sheer wonder." 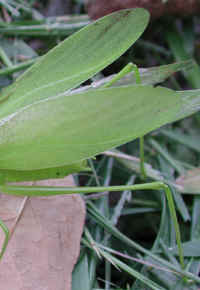 Note the length of the katydid's right antenna, which is longer than the rest of his body. (Katydid Grasshoppers (Tettigoniidae) - 07a) This is an enlarged view of the katydid submitted by Evelyn Giefer. 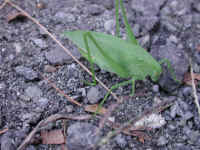 (Katydid Grasshoppers (Tettigoniidae) - 08) - Submitted 7/8/08 by Ralph W. Koepsel, Ider, Alabama. Kodak 330 This Katydid was on the truck and I got this good shot of it. Hours later and it's still there. He/she walked around on me nibbling at my arm...I may have mites or something? 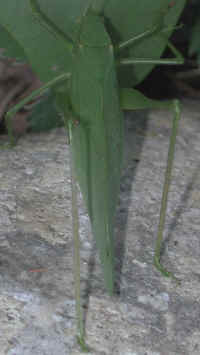 Note the yellow eyes, LONG antenna and the wings that look like a leaf. He/she would use it's front legs to place food/dust/dust mites into it's mouth. 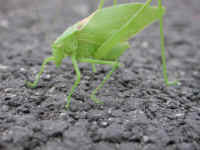 (Katydid Grasshoppers (Tettigoniidae) - 09) This photo was taken by 8-year old Brooke in Missouri. 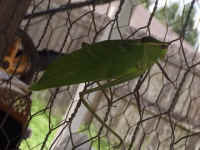 (Katydid Grasshoppers (Tettigoniidae) - 10) This photo was taken by 8-year old Brooke in Missouri. 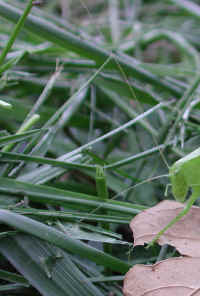 (Katydid Grasshoppers (Tettigoniidae) - 11) This photo was taken by 8-year old Brooke in Missouri. 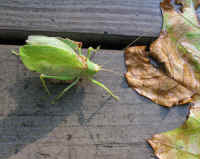 (Katydid Grasshoppers (Tettigoniidae) - 12) Nancy Tharp sent this photograph, which she took of a katydid that was on her deck after a rain shower. (Katydid Grasshoppers (Tettigoniidae) - 13) Nancy Tharp sent this photograph, which she took of a katydid that was on her deck after a rain shower. 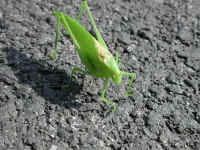 (Katydid Grasshoppers (Tettigoniidae) - 14) We spotted this katydid on the side of the road while we were on one of our walks. (Katydid Grasshoppers (Tettigoniidae) - 15) This is another look at the katydid. (Katydid Grasshoppers (Tettigoniidae) - 16) The katydid then started to move into the grass on the side of the road. (Katydid Grasshoppers (Tettigoniidae) - 17) This is another photo of the katydid. (Katydid Grasshoppers (Tettigoniidae) - 18) This is a right side view of the katydid. 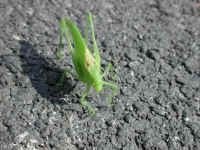 (Katydid Grasshoppers (Tettigoniidae) - 19) This katydid landed on the roadway. (Katydid Grasshoppers (Tettigoniidae) - 19a) This is a closer look at our friend katydid. (Katydid Grasshoppers (Tettigoniidae) - 20) This is a partial side view of the katydid. (Katydid Grasshoppers (Tettigoniidae) - 20a) This is a closer look at the katydid. 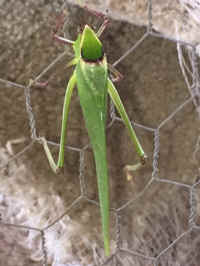 (Katydid Grasshoppers (Tettigoniidae) - 21) This is a left side view of the katydid. (Katydid Grasshoppers (Tettigoniidae) - 22) This is another left side view of the katydid. (Katydid Grasshoppers (Tettigoniidae) - 22a) This is a close up view of the katydid's head, thorax, front 4 legs, and a partial look at the powerful rear jumping leg and folded wing. 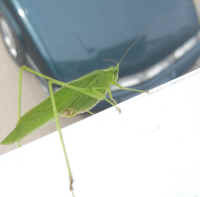 (Katydid Grasshoppers (Tettigoniidae) - 23) Delores sent us this and the next two photos of a katydid, which she spotted in a parking garage in Jacksonville, FL on 9 Feb 2012. 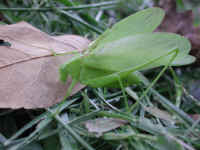 Note that this katydid is a different species than the other ones in this photo journal. (Katydid Grasshoppers (Tettigoniidae) - 24) This is the second katydid photo from Delores, with our thanks. 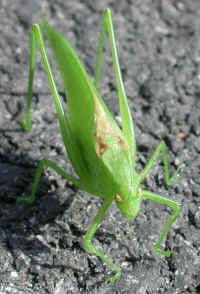 (Katydid Grasshoppers (Tettigoniidae) - 25) Delores said that this katydid measured about 3.5 inches in length. 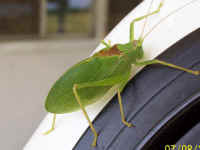 (Katydid Grasshoppers (Tettigoniidae) - 26) Charisse Ramos sent us this photo of a katydid that was on her car in Georgia. Thanks Charisse. 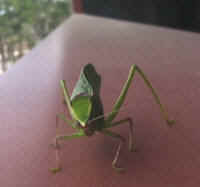 (Katydid Grasshoppers (Tettigoniidae) - 27) Karen Alba sent us this photo of a katydid that she saw in Cape Coral, Florida. "Interesting looking creature." Thanks Karen. (Katydid Grasshoppers (Tettigoniidae) - 28) This photo was sent to us by Diana Cabrera who wrote: "Hope you enjoy as much as my boys did." Thank you Diana. 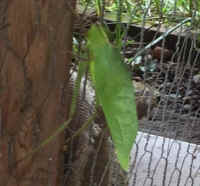 (Katydid Grasshoppers (Tettigoniidae) - 29) One of our visitors sent us this photo with the caption: Can you see me? Found this Beauty in my Garden this evening. So nice to see another friend move in to Sovereign Valley Gardens. (Katydid Grasshoppers (Tettigoniidae) - 30) La Verne wrote: "I am so glad I found your website because I had no clue what this insect was. 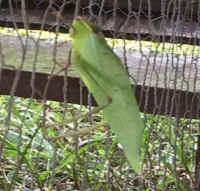 Thought I would send you some pictures of the Katydid that I found in my backyard in Middleburg, Florida. 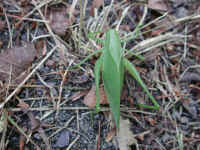 We have never seen one here in the 20 years we have lived here. Well at least I haven't. 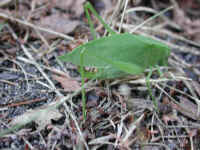 (Katydid Grasshoppers (Tettigoniidae) - 31) This is another of the Katydid photos sent to us by La Verne. (Katydid Grasshoppers (Tettigoniidae) - 32) This is another of the Katydid photos sent to us by La Verne. (Katydid Grasshoppers (Tettigoniidae) - 33) This is another of the Katydid photos sent to us by La Verne. 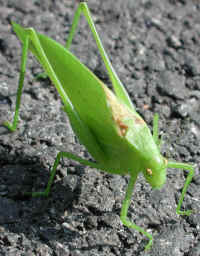 (Katydid Grasshoppers (Tettigoniidae) - 34) TThis image of a katydid was sent to us by Florencia Aldaco http://florenciaaldaco.com with our thanks. 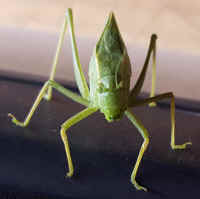 She wrote: "Dear Frank and Mary, I live in Guadalajara Mexico, this Katydid is a regular visitor around my apartment. Currently sits in a small palm in the foyer. I used nikon camera with Macro lens. I have more in case you are interested. God Bless you, Florencia Aldaco"
(Katydid Grasshoppers (Tettigoniidae) - 35) This photo was sent to us by Shelby Flanagan with our thanks. 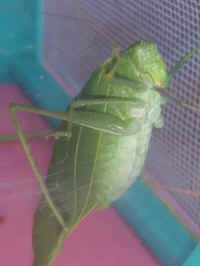 (Katydid Grasshoppers (Tettigoniidae) - 36) Shelby also sent us this photo of the Katydid. (Katydid Grasshoppers (Tettigoniidae) - 37) Ann Marie sent us this photo and wrote: "I found your website, loved it, and wanted to share photos I took of this beautiful Katydid I call "Greenie". The first photo I took was when I discovered him/her on my red Jetta. I had never seen one before." (Katydid Grasshoppers (Tettigoniidae) - 38) Ann Marie wrote: "I had to drive about 10 miles to New Haven, CT to an appointment that morning, and took I95, going about 60 miles an hour. 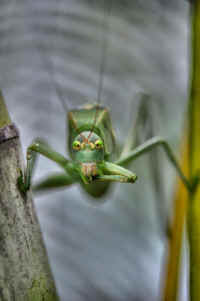 Greenie clung to my side view mirror going and coming back home." (Katydid Grasshoppers (Tettigoniidae) - 39) Ann Marie wrote: "Amazing! 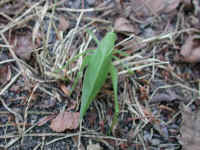 Greenie remained on my car, and then I guess went back into the grasses of "home" after I parked in my driveway." Thank you Ann Marie. (Katydid Grasshoppers (Tettigoniidae) - 40) Nikki took this and the next 3 photos of a trapped katydid. She wrote: "We thought we would take some up close photos before letting it go, and my daughter and I wanted to share them with your website. I think it was smiling for the camera." 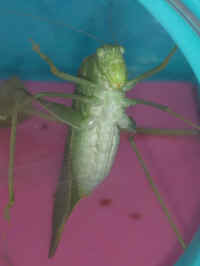 (Katydid Grasshoppers (Tettigoniidae) - 41) This is the second of 4 photos sent to us by Nikki and her daughter. 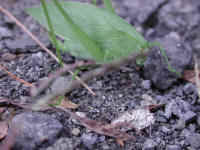 (Katydid Grasshoppers (Tettigoniidae) - 42) This is the third of 4 photos sent to us by Nikki and her daughter. 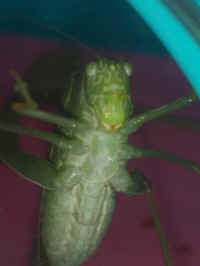 (Katydid Grasshoppers (Tettigoniidae) - 43) This is the last of 4 photos sent to us by Nikki and her daughter. Thank you.